I have never been a monogamous knitter. I am distracted by a bright, shiny new project, and startitis rears its ugly head. Yesterday I opened my mailbox and found the Peacock Feather Shawl pattern, that had been on back-order when I requested it from Woodland Woolworks. I drooled over it for a bit. But I was still captivated by the Bee Fields Shawl, and wanted only to finish with the Great Green Glob so I could start on another lace project. Because I do have some sense of decorum. Two lace project is one more than I should have going at any given time. But then I went to Tangle yesterday. And a new shipment of Malabrigo Lace had arrived. And there were hanks of this gorgeous colorway – Purple Mystery (#30) – that’s perfect for peacocks. So maybe I brought a little yarn home with me. The pattern includes specific directions for a swatch. I really didn’t think that simply swatching was cheating on the Great Green Glob. And the yarn was so pretty. So I wound a ball on my trusty nostepinne (we are low-tech here at chez PI). Hanks of laceweight are so deceptively small. There are 470 yds in one skein of Malabringo laceweight. It’s way smaller than, say, a skein of STR. I started winding. 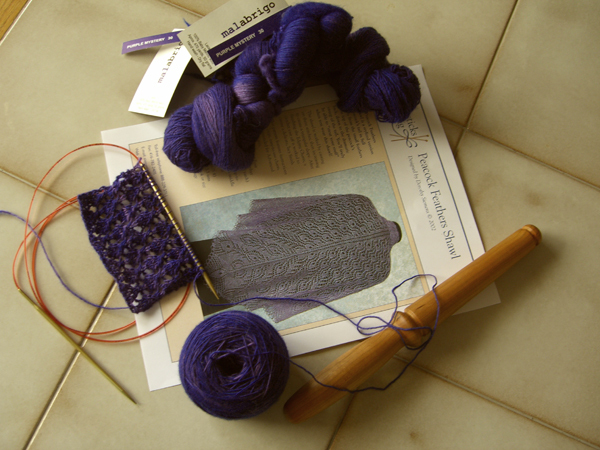 And I wound, and wound and wound… three hours later, I was ready to start swatching. I should really remember this: laceweight takes a long, long time to wind because it’s really, really thin strands of fiber. Please remind me next time I decide to wind it by hand. So I swatched. And I love, love, love this yarn! It is so incredibly soft, it flows across my needles like butter. I would swear that there was something more than wool in this fiber, but the label says 100% baby merino. Who am I to argue with that? And the color just glows! I’m in love. I keep petting my little swatch and holding it against my face. It’s that good. 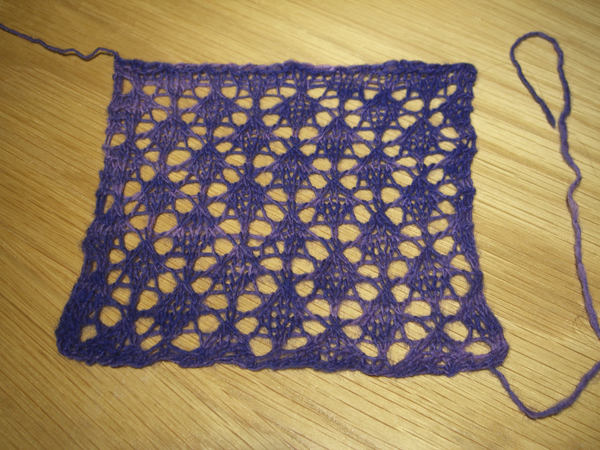 The swatch (according to the pattern) should block out to about 7″ x 7″. My swatch, knit on US#4 per the instructions, blocked out to 5-1/2″ x 5-1/2″. sigh I’m not sure if I should go up one size, to US#5, or two sizes, to US#6. I really like the swatch. I keep petting it. But I need to get one closer to the right size. I have no desire to lose a foot off the shawl. Twisted is a cute little shop with a decent selection of yarn, including yarns from several local and/or indie dyers. They have a great selection of sock yarn. 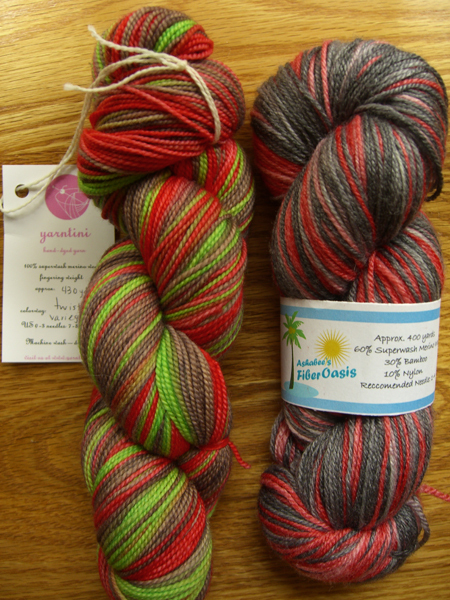 Some Yarntini in the store’s own colorway, Twistini, and a skein of Ashabeeâ€™s Fiber Oasis in Poison Apple (isn’t that a great name?) jumped off of the shelf into my waiting arms and insisted on coming home with me. Gentle reader, I ask you: who am I to argue? I had a wonderful time comparing socks-on-the-needles with one of the owners (Shannon, I think? I will go shoot myself now for not remembering names.) She: Toe-up Monkeys. Me: the dragon-scale, snake-skin, whatevers. It was cool to see the toe-up Monkeys, as I’ve been wanting to knit a pair of Monkeys. But I’m such a toe-up person. Twisted also has tea — a nice change from the rather ubiquitous coffee (this is Portland, after all, caffeine and micro-brew capital of the world). I didn’t have time to drink a cup and knit for a spell, but I plan on going back some day and doing just that. Some day when my wallet can stand the strain, that is. Thank you to all for your thoughtful replies to my last post. I would hope that knitters, as a group, would remain inclusive. But I would also hope that we retain our sense of humor — and that includes the ability to laugh at ourselves. Because, as Mama use to say, others are going to anyway so you might as well join in.